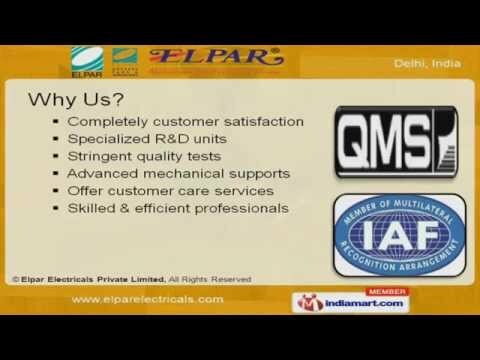 Welcome to Elpar Electricals Private Limited Manufacturer & Exporter of Electrical Appliances The company was incepted in the year 1987 with the brand name &quot;&quot;ELPAR&quot;&quot;. We are an ISO 9001:2008, IAF, QMS & JAS-ANZ certified company. We attribute our present status in the industry to our talented team of professionals and advance mechanical support. Our product list includes Duty Exhaust Fans, Air Coolers & Electric Water Heaters. We offer premium range of Extractor & Designer Ceiling Fans like EKKO Pearl Brown, White & Orchid Wood Finish Fans. Along with that we provide Fix, Foxi, Stila & Hi-Breeze Ceiling Fans that are specifically designed with exact specification as per Industrial standards. We offer a wide array of Farry Pedestal, Roto Grill & Wall Mounting with Light & Fans. Our stylish Ventilation Fans, Fresh Air Fan with Cages, Trans Air & Propeller Exhaust Fans are renowned across the country for less power consumption and reliability. Along with that we provide Five Star Rated, Stilo Instant, Stilo & Tanzo Storage Water Heaters.